North glazing and west entry. 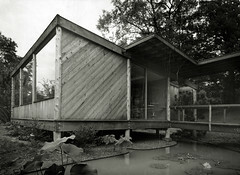 Harris Armstrong's Architectural Office (1948) was designed and built shortly after his success with the Magic Chef Building. By locating his studio at the bottom of the hill, it allowed him to move the office outside of his home, yet still be able to take a short walk to work. In creating the pond, Armstrong addressed a critical problem with the site: it was prone to flooding and served as a drainage way along the South side of the Westwood Country Club's golf course. He took the site's major drawback and made it a wonderful opportunity to place the structure lightly above the ground.